Living on a budget can be difficult. Even when you put into place categories like Food, Clothing, Eating Out, and Frivolous, determining how to categorize your spending can determine how much money you’ll actually save. 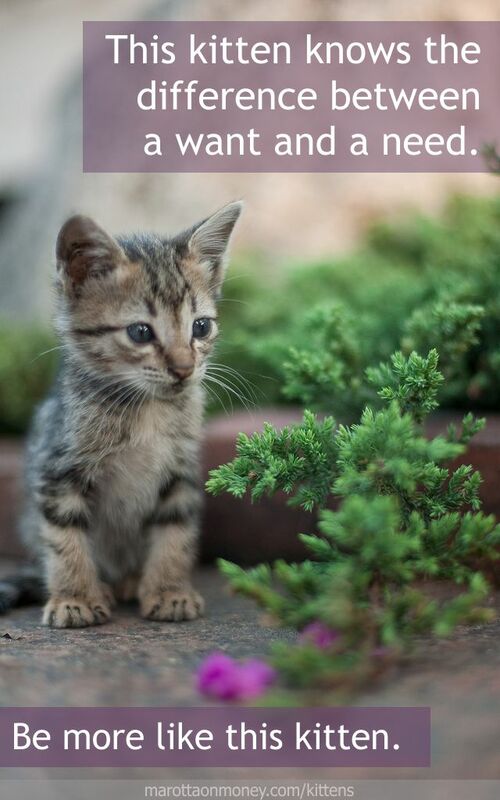 This kitten gets the most out of her budget by having clear distinctions between her budget categories that are needs and those that are wants. She knows that a restaurant cooked salmon dinner is a want that comes from the smaller Eating Out category rather than the larger one of Food and a mummy cat Halloween costume is Frivolous not Clothing. She sat down with her family and decided what fits in each budget category. As a result, she knows the difference between Home Supplies and Home Decor, Food and Eating Out, Health and Beauty, and more. She doesn’t cheat herself out of saving money by assigning wants to her needs budget. She also doesn’t fool herself in the grocery store into thinking that just because some essential groceries are on the bill that she needs everything in her cart. She saves money by allowing her budget to curb her impulses. Photo taken by Kenny Louie and used here under Flickr Creative Commons.